I will post my May 2017 summary using data from mid June since I did not get a chance to make this post earlier. The stock market has been very generous to long investors. 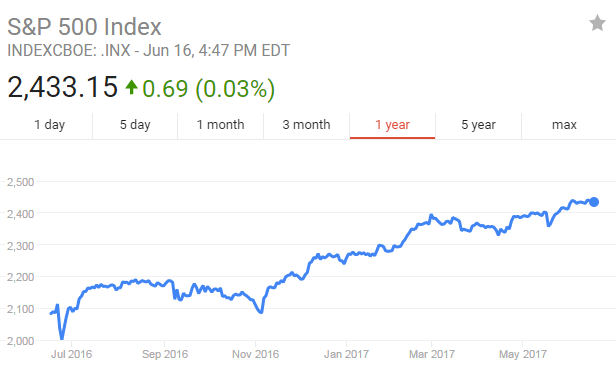 Stock prices have continued to head higher. Industrials and Technology companies have been leading the rise. However, nearly all sectors have seen rising prices. As of the 14th of June, the Fed has raised the interest rates by a small 1/4 percent. Crude oil has been continuing its drop downward below the $50 mark. I do not own many companies that are impacted by crude oil production directly. I no longer own shares in oil & gas or pipelines so the tough times in oil is not of much concern to me. The US dollar has been weakening compared to the start of the year. This bodes well for many of the international companies like KO, PM, and JNJ who do sales internationally. A weakening dollar means rising earnings from money made overseas when converted back to US Dollars. I'm probably sounding like a broken record by now... The purpose of my investments is to become an income source for my personal use in the future. I do not buy low to sell high. In fact I do not very much mind buying high as long as what I buy can provide me with income. Every share I buy I treat it like an ATM machine. As long as the company I buy can keep spitting cash out to me every quarter life is good. If the ATM machine starts to break because of deteriorating fundamentals, I will sell it since I want the ATM machine to keep spitting out cash. My investing philosophy is much different than the popular media's view on stocks. I invest for income. Every share I purchase will pay me every quarter. Every quarter, that company will (literally) send a check to my mailbox which I can cash in to pay for my groceries, transportation, entertainment, and housing. I do not plan to ever sell shares in businesses that I own unless I believe there is something direly wrong with the company's fundamentals. In essence, I hold stock like I hold rental properties. Stocks provide me income every month of the year. I could care less what the market values the business as long as the business pays me every quarter. In addition to providing income every month, I want my investments to increase their dividend checks every year by themselves. Companies grow either organically or through M&A. Inflation happens, causing company earnings to grow as well. The whole purpose of the CEO is to ensure that the company makes money and grows. His job is to do everything in his power to make that happen. In essence, the CEO is working for us, the shareholders. If management is not doing a good job, then the shareholders will vote to elect new members in. In the end, I want to benefit from the growth in the enterprise and that benefit is through dividend checks. Since income is so important to me, I want to make sure that the businesses that I own are capable of paying me dividends every quarter without issue. I also want to make sure the business can increase that dividend every year no problem. As a result, I tend to rely on businesses with non-cyclical personalities. During economic recessions, the last thing I want to see is for a company to cancel its dividend due to "hard times". 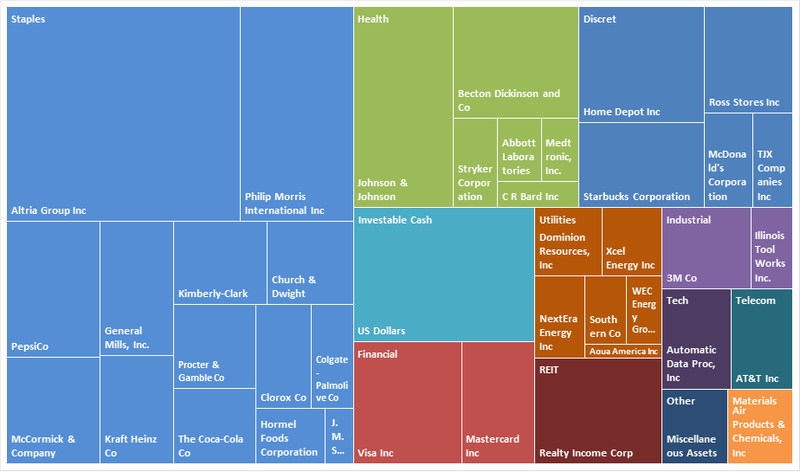 Most of the companies I own are in the consumer staples business. These companies sell products like food, drinks, toilet paper, cleaning supplies, shampoo, toothpaste, etc. They are boring companies but they provide very consistent growth and a very stable cashflow even during economic recessions. My largest holdings right now are Altria and Philip Morris (tobacco makers), Johnson & Johnson (a healthcare conglomerate), Home Depot (home improvement store), and Becton Dickinson (a medical device and instrument company). As of June 17, my portfolio is sitting a bit over the $375,000 mark. I am a little ahead of schedule for my goal of $1MM. Spikes in the net worth are due to unexpected payouts in my career. I believe eventually I will be able to hit the $400,000 mark. My "margins" are very high at the moment since my living costs are very low compared to my take home income. Nearly all of my income is invested back into shares of businesses which pay income. 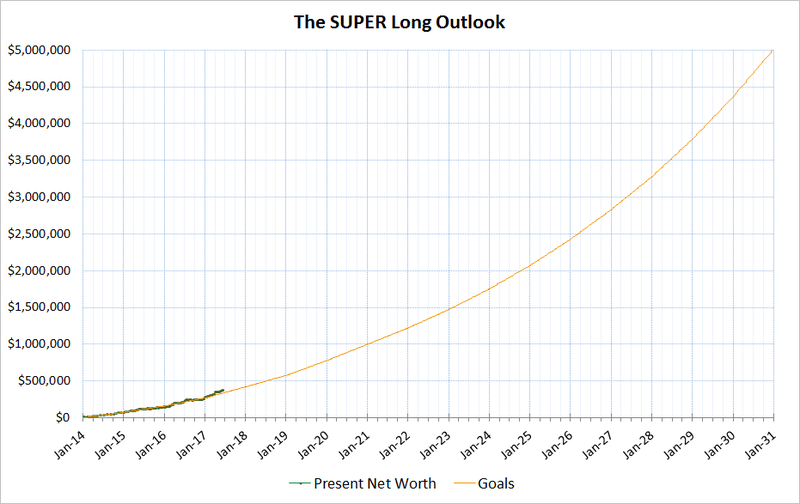 I decided to take a step back and plot what I think my portfolio can become years after I reach my goal if $1,000,000. This graph includes contributions I put into my account every month. In the latter years, I find that the portfolio grows by itself much more than what I contribute into the portfolio. I used data from the past with the acknowledgement that past performance doesn't predict future performance. In the backtest I chose investments that were similar to the companies I invested in today, namely dividend aristocrats which increase their dividends every year. 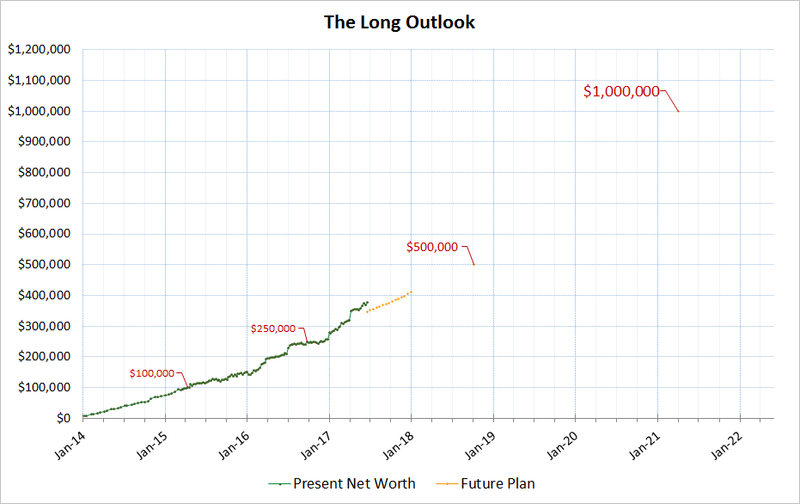 The graph is an interesting display of what compounding can do to one's wealth. If an investor starts early, the early years are rough as the portfolio appears to grow only from one's personal contributions. However, as the portfolio matures into the 10th year, 20th year, and 30th year, the results are staggering. I can't predict the results of the next 20 or 30 years. However, the past 100 years of the US Stock Market has been consistently impressive. I'm willing to bet that such American economic ingenuity and the "secret sauce" that the US has to innovate will continue propelling businesses forward decades into the future. After $1MM, the second million becomes progressively easier (nearly half the time). The third million becomes even easier (1/4 of the time). And the fourth 1/8 of the time, and etc. This shows how capital can make capital by itself. Eventually, there is no need to save one's paycheck and contribute directly into the portfolio since the portfolio by itself has reached escape velocity. Although $1MM is my short term goal for my early 30s it is only a very small drop in the overall bucket. My extremely long term target for old age is in the Decamillion category (8 figures). I believe the investment strategies laid out in this blog can one day make that possible for me, and I will log my progress on this website every month. MKC fell a bit more than 3% today. What a joy to see what a high quality company going more on sale! I purchased $3,000 in MKC today on the open market today. My strategy is to add more if it falls 5-10 more %. 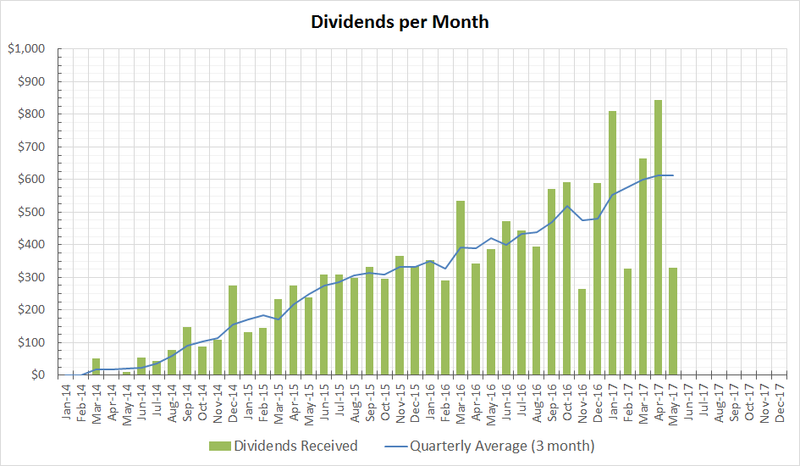 A little late to post, but here are the dividends I received in May 2017. I got $330 this month. Not bad. 2/5/8/11 months are lighter paying months for me since most of the companies I hold pay in other months. Note that I now no longer hold any Verizon. I am considering adding more to AT&T to cover that high yield telecom space. I purchased a lot of shares in the last week. I haven't posted the update yet. Here is a list of what has been added to my portfolio recently. 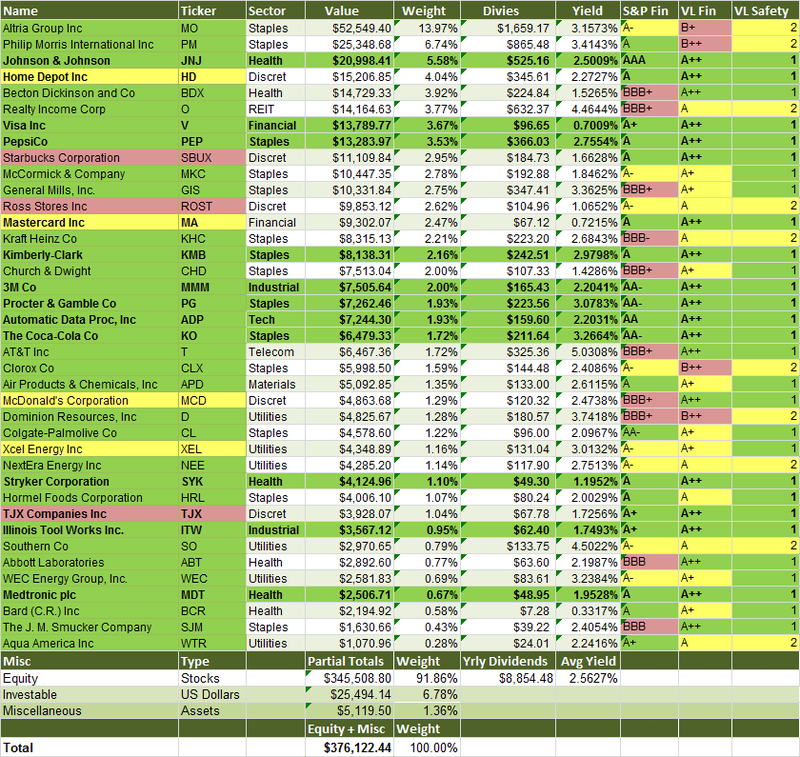 Since I have 100 free trades a month I took the liberty to spray my purchases across several companies. After calculating the dividends, this set of investment will increase my annual dividend by $400 a year. My portfolio is now around $8713 in annual dividends.